There are several things that should be done appropriately in order to feed a resident who cannot feed themselves. These steps have to be done correctly to get the most efficient care to the patient as well as prevent any injury or infection that may happen to them. You will have to do them properly as well, in order to pass the CNA certification examination, and to maintain a good working status in the nursing facility that you are working in. In short, they are an essential part of the job if you want to keep it. The first step is to first greet the resident and introduce yourself when you enter the room. Make sure that you address the resident with their proper name and not with their nickname. Inform the resident as to why you are there and explain the different steps that will be taken in order to feed them. This should be done before and while you are feeding them. Tell or assist the patient to get into a sitting position before feeding them. Ask them also if they want to wash their hands before they eat using a wet washcloth, a paper towel, or a hand wipe. After this, sit on a chair in front of the resident in order to feed them. Ask the resident if they want to use a bib or a napkin in order to protect their clothing from any accidental spillage before feeding them. Use the appropriate size of spoon for feeding the resident. Try to let the resident take a sip of liquid at least every two or three spoons of food. Give them the time to chew their food thoroughly and to swallow it before offering the next spoonful of food. As the resident is eating, try to engage them in a light conversation in order to lighten their mood and help their appetite. When the resident is done eating, try to wipe the area around their mouth dry with a clean piece of napkin or towel. Finish the feeding session by placing any dirty linen on the hamper and placing the trash on the garbage can. Try to keep the overbed table as clean and dry as possible. After this, you can proceed to record the amount of intake of the resident on the Food and Fluid Intake Form. During the process, make sure that you have taken the resident’s requests and preferences as to the feeding. It is important to make all the necessary standard precautions as well as methods of infection control during the whole process. 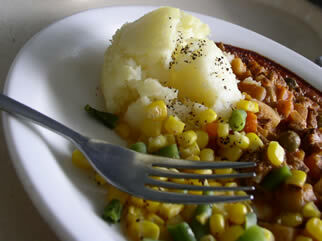 Ask the resident if they feel comfortable with the feeding and what other needs do they have. Make sure that you have taken all the necessary steps to provide the resident with his rights as to privacy and safety during the whole process. It is important to keep these things in mind in order to provide the best feeding care to a resident who does not have the ability to feed themselves.